Pita is a 14 year old boy. Pita's father has a small farm growing cassava and works as a labourer when it is possible to earn cash for the family. 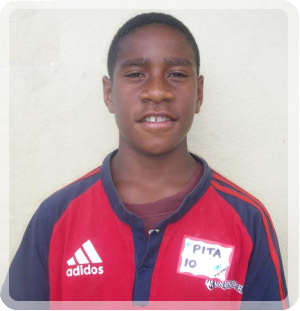 Pita enjoys attending school and his favourite subject is all subjects. When he is not at school he loves to playing soccor. Pita travels to school each day walking on foot. Pita is a hardworking and obedient boy and is punctual to school. He is a very skilful soccer player.